I brought this little tool around half a year ago on one of those days where I was let loose in Boots with money in my purse and just picked up random items thinking I need them. On big nights out I always wear false eyelashes, I love them and just feel they look so gorgeous on. However, I have a very unsteady hand and so I thought this contraption could really help me apply my lashes. These 'tweezers' have two ends the first end is the tweezer-end which has a wide and curved shape that clamps the eyelashes and allows you to apply them in the correct place. The other end is an angled tip that can be used to press down the lash ensuring it is stuck down properly. 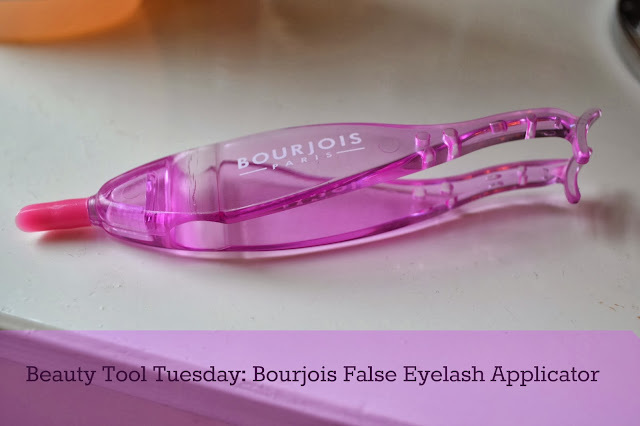 This end is extremely useful for the inner corner of the lashes as personally I always find that bit the trickiest with it always not sticking properly. I really am undecided as to whether I like this product or not. The thing is it is slightly unnecessary, lets be honest we have fingers that can do pretty much the same job but leaving them covered in glue and sticky (in my case anyway) I thought that this product would enable me to not get eyelash glue all over my fingers but don't be fooled you still have to fiddle about with your hands to make sure the lash is perfectly on. Also, regular tweezers do pretty much the same job they just aren't as easy to use. In my opinion, this product is great for someone just starting to use false eyelashes as it would make it much easier for a first-timer but as a frequent eyelash wearer this isn't a must buy product.